You can also download a list of Frequently Asked Questions as a pdf. What is a Swim England Friend? Swim England Friends are volunteers who are available to give impartial assistance and guidance to Swim England members or their parents on matters involving the Swim England Judicial Regulations, Club Constitution / Rules and the Swim England Code of Ethics and accompanying Codes of Conduct. Our Swim England Friends have a wealth of experience in the world of aquatics and a knowledge of the regulations, constitution and judicial procedures. They also have in-depth knowledge of swimming clubs and how issues such as yours may have been resolved in the past. Swim England Friends are not just there for one-off advice. You can keep going back to your contact in the case of an ongoing dispute. Swim England Friends are assigned on a case-by-case basis. If you have an issue that you are not sure how to resolve, please contact signposting@swimming.org and we can put you in touch with someone appropriate to your dispute. We require all affiliated clubs and organisations with members under 18 to appoint a Welfare Officer. The Welfare Officer is responsible for ensuring their club or organisation is adopting and implementing WavePower, the Swim England Child Safeguarding Policy and Procedures. All Swim England affiliated organisations hold a copy of our Child Safeguarding Policy and Procedures document, Wavepower. Head to our Wavepower pages to view it for yourself and find out more. We also have a child protection helpline called Swimline. Callers to Swimline can leave their name, contact details and a description of their concerns, and will the be contacted by our Safeguarding Team within 48 hours. There is also the opportunity to transfer to the NSPCC Child Protection Helpine if urgent assistance is required to protect a child. The first step for any coaching concerns with your club is to arrange a time to speak directly to the coach, or the head of the coaching staff. If you have tried resolving your issue at club level and are still in dispute, you can raise the issue with Swim England by emailing signposting@swimming.org. Our Coaches Referral Protocol outlines the steps we will take when a concern is raised with regards to coaching techniques. If you have a question about coaching disputes or wish to raise the issue with us, please contact signposting@swimming.org putting as much detail as possible about your dispute. Do I have to be a member of the Swimming Club to start a complaint process? A person wishing to make a Complaint must have been a Swim England member at the time of the event(s) complained about, or have been attempting to obtain membership. Parents or guardians can submit a Complaint Form on behalf of a Swim England Member under the age of 18. If you remain dissatisfied with the outcome of an internal club process there is an option to raise a formal complaint with Swim England over a dispute at your club or breach of Code of Conduct. There is a charge of £50 for registering a formal complaint with us. If there are concerns over whether it is safe for you or your child to be participating in aquatics sessions, Swim England affiliated clubs can receive advice under the Medical Protocol. Our Medical Protocol Terms of Reference outlines the process we will take if a written reference is received. 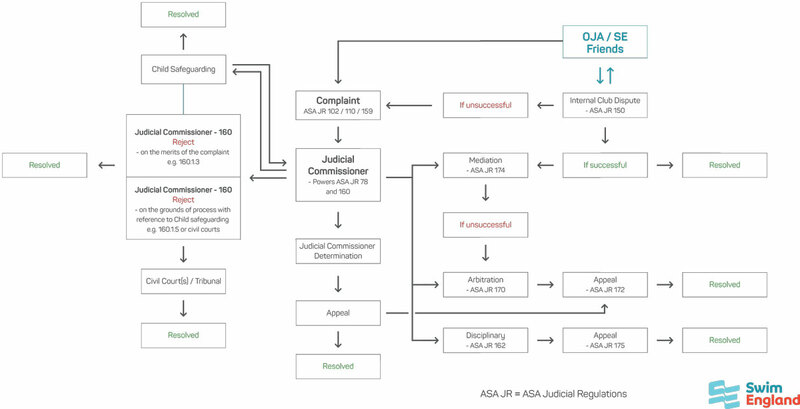 Click or tap on the image below to download a PDF copy of a flowchart outlining the stages of our judicial process.